On the outside, there's not much to sleep beside a few snores here and there and funny dreams. But in reality, your body is going through crucial processes that help you function when you're awake. 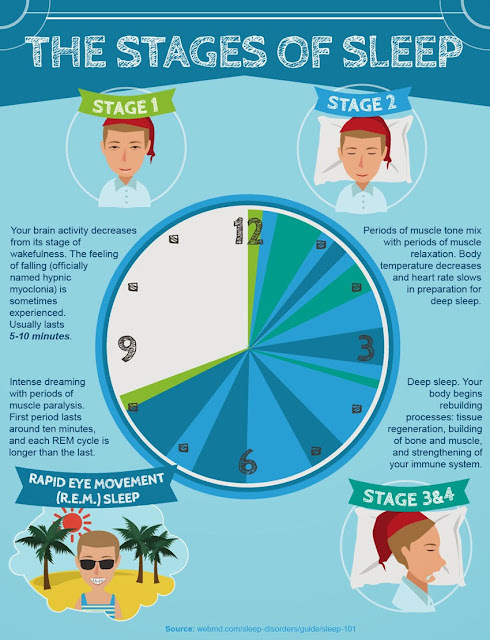 The stages of sleep can be divided into two distinct phases: Non-Rapid Eye Movement (NREM) and Rapid Eye Movement (REM). In Stage 1 of NREM, your brain activity slows down from its stage of wakefulness, and if someone were to try and awaken you, they'd be able to do so without difficulty. You may also experience the common sensation of falling (hypnic myoclonia) during this stage, and the stage lasts from five to ten minutes. In Stage 2, periods of muscle tone mix with periods of muscle relaxation. At the same time, your body temperature drops and your heart rate slows down to prepare you for deep sleep. In Stages 3 and 4, you enter a deep sleep, and your body begins several rebuilding processes, such as tissue regeneration, bone and muscle building, and immune system strengthening. Stages 3 and 4 complete similar processes, but Stage 4 is more intense. After the fourth stage of NREM sleep, you enter REM sleep. The first stage of REM sleep begins about 90 minutes after you first fall asleep and lasts around ten minutes, with each stage lengthening until the final stage, which can last as long as an hour. During REM sleep, your brain activity is increased, and you experience intense dreaming and even periods of muscle paralysis. As you get older, your sleep cycles change slightly. Your deep sleep stages begin to get shorter and shorter, and you spend less time in REM sleep; adults spend about 20% of their sleep in REM, while infants spend nearly half their sleep in REM. Contrary to what you might think, sleep stages don't progress linearly. It starts off as you'd expect, in Stage 1, and moves through Stages 2, 3, and 4; then, your body goes back through Stages 3 and 2 before entering REM sleep. After REM sleep, your body usually goes back to Stage 2 sleep, for a grand total of roughly four or five cycles throughout the night. Whether you wake up feeling well-rested or cranky and tired, it largely depends on how many stages of sleep you're able to cycle through. Make sure to allow yourself enough time to move through an appropriate number of sleep cycles, and you'll wake up on the right side of the bed every day.